← Vibram Fivefingers – 2014 Fall are here! BMW R Nine T has finally arrived. A naked boxer with a strong, emotional hook. As part of its 90th anniversary celebration at company headquarters in Munich, BMW Motorrad took the wraps off the R nineT, a new bike that looks a bit like a one-off custom but is actually a 2014 production machine scheduled to go on sale at U.S. dealers in March. One quick look at this naked roadster is all it takes to see that BMW’s designers and engineers have had some fun creating this boxer-powered machine, which pays homage to the R90S of the 1970s while aiming to attract a hipper, more contemporary crowd with its stripped appearance, rich textures, black wheels, and gobs of accessories designed to encourage personalization. Perhaps the most significant, and likely very popular, is a brushed-aluminum tail section that immediately transforms this new BMW from a naked roadster into a Germanic café (Kafe?) racer of sorts. In keeping with the simple theme, BMW powers the 2014 R nineT with the air- and oil-cooled version of the company’s 1170cc boxer engine, not the liquid-cooled twin found in the new R1200GS. Moreover, the R nineT’s engine, with a claimed 110 horsepower and 88 pound-feet of torque, serves as a stressed member in a new tubular steel chassis, which is a modular design with front and rear sections, plus an end piece and a pillion frame, all bolted together. The exhaust, which runs down the left side of the R nineT, can be mounted in a lowered or raised position, depending on the length of the connector accessory pipe ordered. 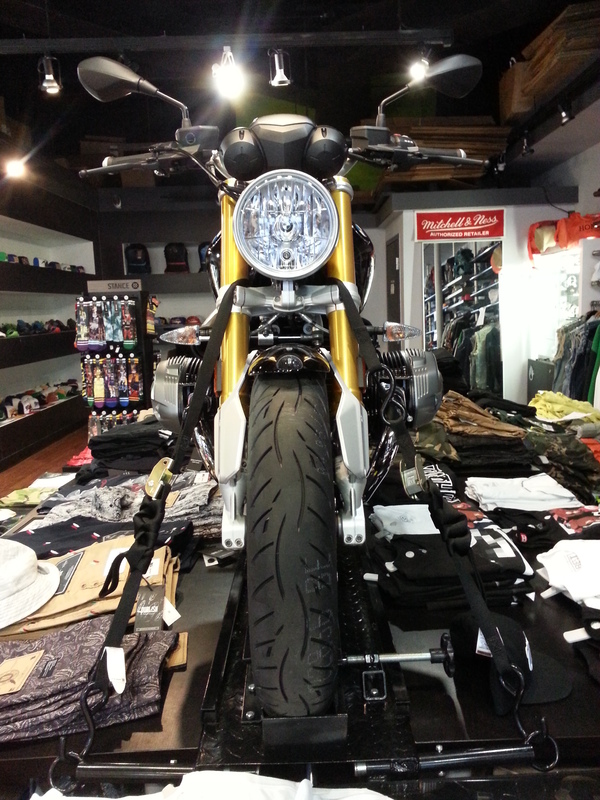 A titanium Akrapovic exhaust is also available as an accessory. To maintain a traditional look, the inverted 46mm Sachs fork (from the S1000RR) is employed up front, in place of BMW’s usual Telelever front suspension. BMW says the conventional fork allows the headset to be lower while also permitting the oil cooler to be tucked out of the way in a central position, where—believe it or not—it serves as an anchor point for the R nineT’s turn signals, which at this early stage don’t look large enough to meet U.S. regulations. At any rate, a bracket on the lower triple clamp holds the classic round headlight, which should be easy to change because BMW has simplified the wiring loom to make the bike easily accept alternate electrical components. In back, the proven Paralever single-sided swingarm from BMW’s other air-cooled boxers is employed, and a vertical strut with a white coil spring provides damping. Spring preload can be set via an aluminum hand wheel; rebound damping, says BMW, is infinitely adjustable. As for some hard numbers, BMW claims the R nineT has 4.7 inches of suspension travel front and rear, along with a seat height of 30.9 inches and a 58.1-inch wheelbase. Moreover, the new BMW, which weighs a claimed 490 lbs. in wet, ready-to-ride form, looks like it will be an entertaining ally on a twisty road, given its steering head angle of 25.5 degrees and 4.04 inches of trail. Neat details abound. The 4.8-gallon gas tank is aluminum, with brushed, unpainted sections that can be covered with accessory kneepads; the triple clamps, along with the tapered bolt bosses, are bead-blasted before being anodized for an appealing texture; there’s enough clearance for the 17-in. rear wheel, which is 5.5 inches wide, to be replaced by one that’s half an inch wider if the owner wants to switch to a tire that’s larger than the stock 180/55R rubber; the housing for the rear axle drive, as on other boxer models, includes three mounting points that can be used to attach a license-plate bracket; and lastly, the forged aluminum brackets for the small front fender may look like overkill to support the tiny front fender, but they show a link to classic bikes of the past and are but one of many examples in which hardware is proudly shown, not hidden. During the unveiling of the new RnineT at the BMW museum—in which BMWMotorrad celebrated its 90th anniversary and reminded us that, for many years, BMW was a motorcycle company that also sold a few cars—various company officials spoke about the new bike and how the emotional hook will be firmly set with its purity of design, its high-quality materials, its handcrafted nature, andits overtly mechanical look. “People want to see mechanical parts again,” explained Edgar Heinrich, head of BMW Design, who, not coincidentally, was standing near one of the first BMW motorcycles ever, an unabashedly mechanicalR32 of 1923. “People want to see the pivots of theswingarm. They want to see the function of all the parts.” Is Heinrich right? The popularity of naked bikes today seems to bear him out. But has BMW built the bike it has described? On appearances alone, it looks that way. 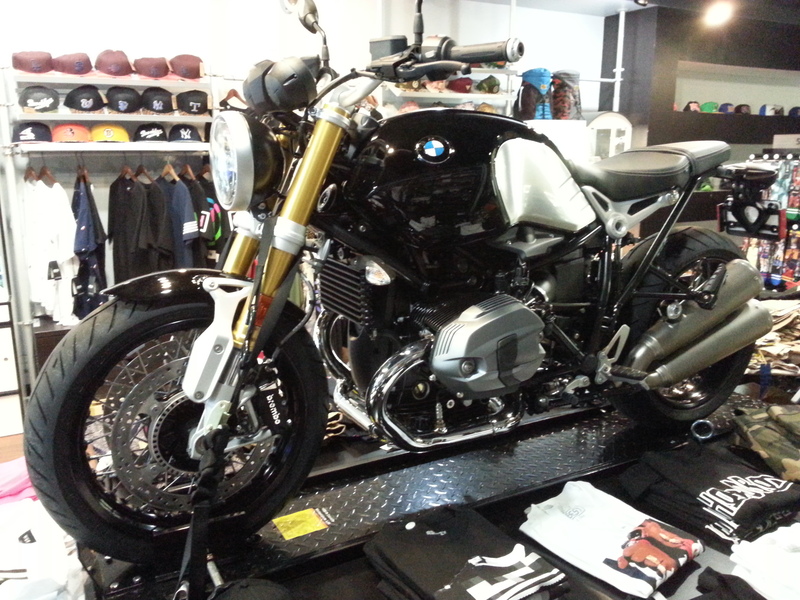 The RnineT does blend retro cool with expected modern reliability and manners, but the proof will come when we ride the black (its only color) bike, which will happen likely in early 2014. No word yet on pricing. So, for now, we’ll view the RnineT as a great 90th birthday gift for the folks at BMWMotorrad, plus a bike that has great potential to bring more young buyers into the BMW fold.